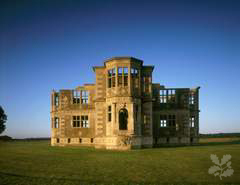 This incomplete Elizabethan garden lodge remains virtually unaltered since building stopped 400 years ago. Designed by Sir Thomas Tresham in the shape of a cross, with fascinating architectural stonework, the lodge is set in beautiful open countryside, with the remains of the moated garden adjoining the site. Opening Times Daily except Mon & Tues: 9–5. Large Parties by arrangement with the Custodian. Elizabethan water gardens open to groups by arrangement.